Coonley offers tours (one tour encompassing all of our educational programs) for interested parents. The third Thursday of each month a tour is available starting at 9:30 a.m. near our main office. Registration is not required. Please check our calendar for specific dates. Please note: Coonley no longer has a Pre-School program and will discontinue the Kindergarten and First Options (Regional Gifted) program in 2019-2020. Click HERE to access the Chicago Public School Elementary registration checklist which lists the approved documents that may be used for registering your child as well as the required medical and dental forms. 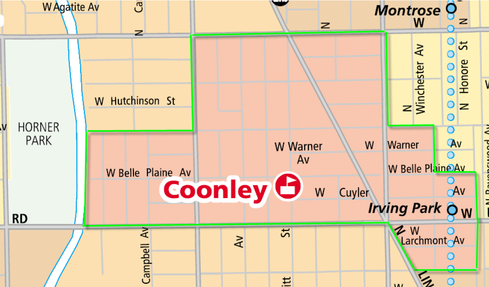 Enrollment is reserved for students that currently reside within the Coonley attendance boundaries (http://schoollocator.cps.k12.il.us/). If you have moved outside of the Coonley attendance area in the last year your child should enroll in their new neighborhood school. CPS will initiate address verification procedures when inconsistencies in documentation arise. If enrollment is found to be fraudulent CPS will act in accordance with the District's Enrollment & Transfer Policy and a violation of said policy may include an immediate transfer to the student's appropriate home school. If families are found to be living outside the City of Chicago tuition may be charged. If your child was accepted to Coonley from outside the attendance boundary prior to June 30th, 2010, or through the Sibling lottery then Coonley becomes the home school for your child until graduation. If you have questions, please call the school office 773.534.5140. Students seeking admission to Coonley that reside outside of our attendance area must apply using the Options for Knowledge Standard Elementary Application available within the Options for Knowledge Guidebook or online at http://cps.edu/AccessAndEnrollment/Pages/Apply.aspx. The application is available October 1st through mid December. Please follow submission guidelines provided by the Office of Access and Enrollment. Notifications are sent in the spring prior to the start of school. More information is available at http://cps.edu/AccessAndEnrollment/Pages/OAE.aspx. All Regional Gifted Centers in Chicago require testing for admission. Children are selected for entry based on their performance on an aptitude test administered by the Office of Academic Enhancement (OAE). For the 2019-2020 school year Coonley’s RGC programming will begin at 2nd grade. To apply to Coonley's Regional Gifted Center use the Selective Enrollment Elementary School Application from Chicago Public Schools. The application process is described on the CPS website and you can also download an application there during the application period, usually the beginning of October through mid December.